We had gotten used to the questions. Can non-Christians apply? 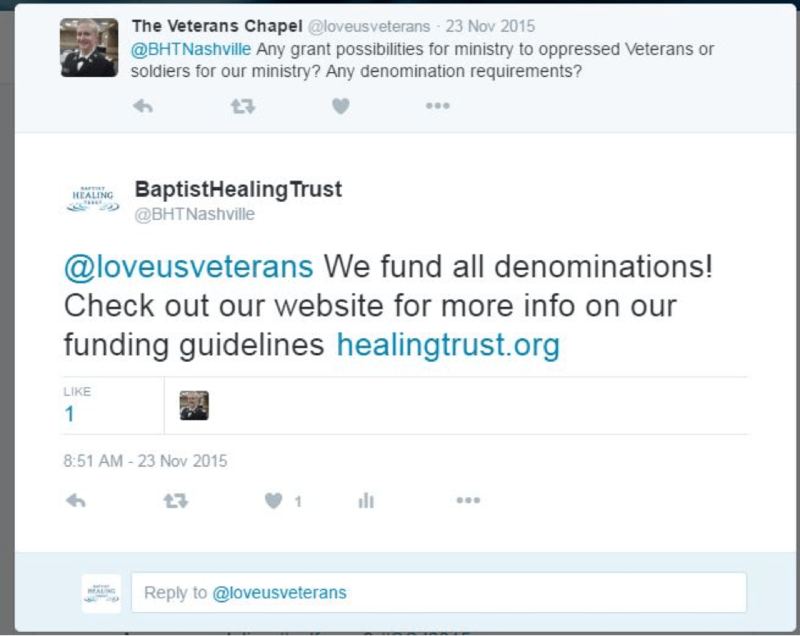 Are your grants only for Baptists? Are you a part of Baptist Hospital? We answered the questions whenever we were asked and one day, we received a tweet. We were constantly being misunderstood, and it was going to continue unless something changed. For years, our staff explained to many people, through a variety of channels, that our funding was available without faith restrictions, and that we weren’t a part of the well-known local hospital, Baptist Hospital. And, yet, confusion about our brand and our funding persisted. We were sending the wrong messages. Like some other healthcare-focused foundations, we were created from the assets of the sale of a community hospital into a large hospital system. The hospital was originally named Baptist Hospital, and by a combination of default and design, we became the Baptist Healing Trust. The similarity in our names and the previous proximity of our offices to the hospital caused people to believe that we were connected. We are also located in the heart of the Bible Belt (complete with a statue of Billy Graham downtown), so there was an additional assumption that that the word “Baptist” indicated that we had a religious affiliation. We’ve never restricted or provided funding on the basis of faith, but, because of our name, people believed that we only provided funding to faith-based organizations or that we were the philanthropic arm of the hospital. We realized that, through our name and logo, we were unintentionally creating messages about our brand that weren’t true. We strived to be inclusionary in all our practices and were deeply concerned about the perception that we had faith requirements for funding. Our Statement of Inclusiveness is central to our operation and we ask applicants to review our statement prior to applying to ensure that their programs and our philosophy is compatible. Our first task was to have internal conversations about faith. Over the course of several months, our board members discussed the role (or lack thereof) that faith had on our organization, both personally and on a mission level. The staff also had internal conversations and met with a small segment of the Board to share the impact that we believed faith had on our work and our relationship to our community. We also hired an outside facilitator who surveyed and interviewed the staff and board about our strengths, opportunities, and the parts of our culture that we needed to keep. 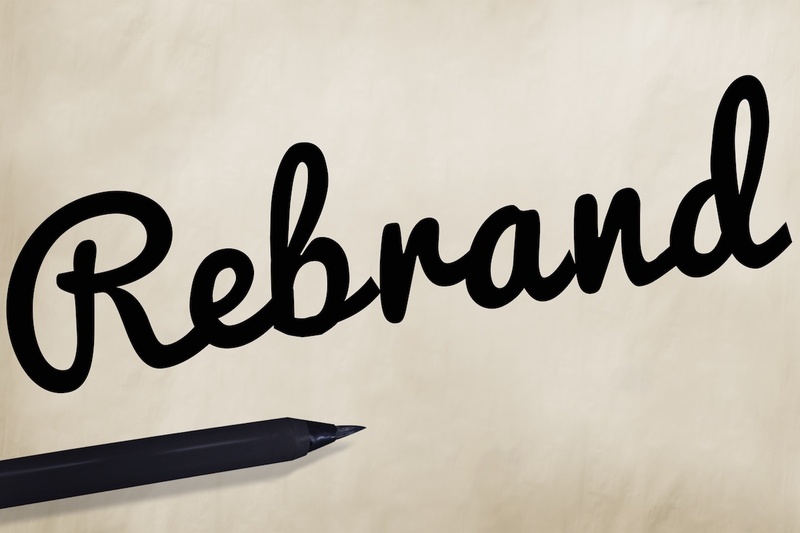 We then explored the impact that a name change would have on our grantees. We operated from a philosophy of partnership and understood that the staff and board perspectives were not the only ones that mattered. We invited a group of grantees, board members and community partners to participate in a “culture café” in which a facilitator guided us through the Appreciate Inquiry Process (AI), which is a bit like conducting a StrenghthsFinder assessment for an organization. Attendees were also asked to share what was most valued about our culture and what was unique about us. We were fortunate to have a board member, with a background in market research, facilitate a focus group with a small group of grantees around potentially changing our name. Brand confusion wasn’t the only type of confusion that we were creating. During the grant application process, we require our applicants and grantees to interact with our website to apply, submit reports, register for events, etc., and it was often a source of confusion. The old website was very text-heavy and somewhat unreadable. It was such a problem that we dedicated a portion of our workshops to navigating the website, but would still frequently receive calls about locating things that should have been fairly easy to find. “While The Healing Trust’s website has always offered the community an exceptional resource for getting connected to its mission and vision, it was admittedly challenging at times to locate specific documents or information,” said Carter Abel, development consultant for Aphesis House, a transitional housing agency for men who have been incarcerated. We ran readability scores on our website content and were initially shocked to discover that the content wasn’t as easy to understand as we had assumed. We edited the content to make it easier to understand, decreased the amount of text and added more images. We decided to invest in creating a more intuitive, mobile optimized website that would decrease the amount of time our applicants/grantees spent searching for things and that would correspond with the new brand that we were creating. 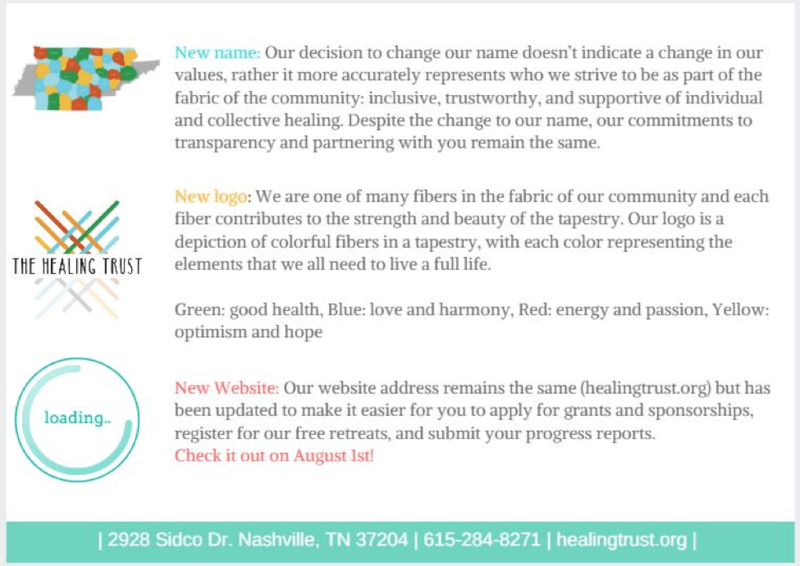 As a result of our strategic process, we decided to remove the word “Baptist” and become The Healing Trust. During the focus group and the culture café process, participants repeatedly emphasized the trust that our grantees placed in our relationship with them and that the word “healing” spoke to our emphasis on health and compassion. The Healing Trust more accurately represents who we are as an inclusive foundation that supports individual and collective healing. We rolled out our new name, logo and website on the same day. We mailed postcards to our grantees, updated our social media channels, and sent a blast email to multiple audiences about the changes with an explanation about those changes. “The Healing Trust has always been known for being extraordinarily accessible to the community and the nonprofits it partners with. The new website brings its online experience up to that same level of accessibility, making it easier than ever before to get informed and connected to the Trust’s work across middle Tennessee.” said Carter Abel, development consultant. “The new logo weave is so representative of what the Trust has become – and name sounds much more inclusive while embracing the “trust” of Nashville and Middle Tennessee,” said Sharon Weaver, management consultant. We have joked that we were going to receive a record number of applications in our upcoming grant cycle because more people will realize that they can apply to us and, thanks to the new website, will be able figure out how to apply. While that remains be seen, we are committed to monitoring the success of our rebranding project and to serving our mission.